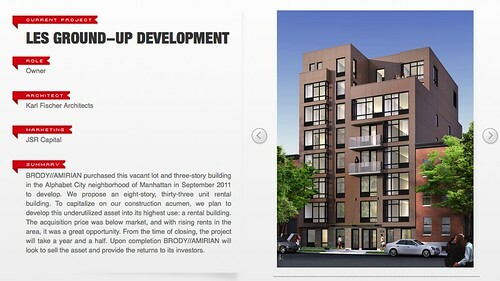 Nine-Story Dorm Bound for 35 Cooper, But Whose Is It? Claire Glass and Stephen Rex Brown The demolition of 35 Cooper last year. So, what university is behind the dormitory planned for 35 Cooper Square? EV Grieve first spotted the plans, filed with the Department of Buildings yesterday, which call for over 30,000 square feet of student housing. But which students will stay there? “Not N.Y.U.’s,” wrote university spokesman John Beckman of the dorm. “We already have a dorm on Third Avenue,” said Jolene Travis, spokeswoman for Cooper Union. Stephen Rex Brown A worker at the site. 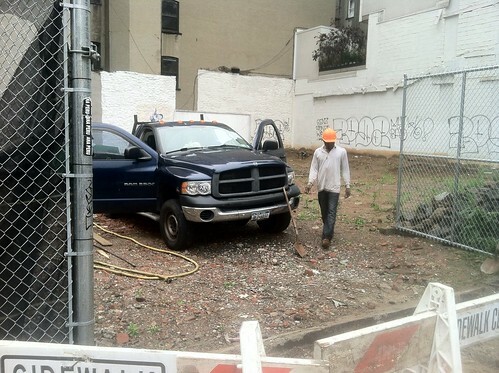 Construction workers at 35 Cooper Square were preparing to pour concrete for a new sidewalk this afternoon, but knew nothing about any plans for the closely watched lot. Last year preservationists fought a losing battle to save the Federal-style building built around 1825 that once stood there. 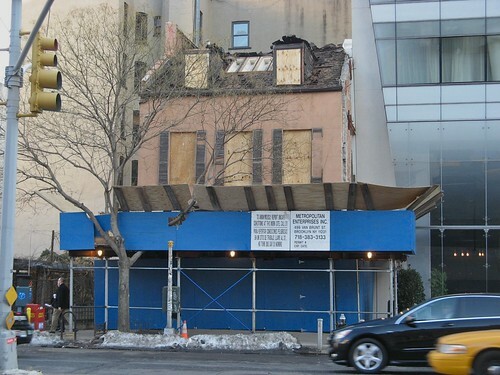 The eight-story, 33-unit building replacing an antebellum row house at 316 East Third Street has been revealed. The building, designed by the oft-criticized Karl Fischer, features large windows and a linear aesthetic similar to the architect’s design for 427 East 12th Street. Stephen Rex Brown The rowhouse at 316 East Third Street. Last week, preservationists doubled down on their last-minute effort to protect a 177-year-old row house that the owner hopes to demolish and replace with a seven-story, 33-unit apartment building. A quartet of local preservation groups began pressing the city Landmarks Preservation Commission early this month. In a letter you can read below, the coalition cited the building’s historic qualities, which are reminiscent of 35 Cooper Square, another Federal-style row house that was demolished in May amid much controversy. 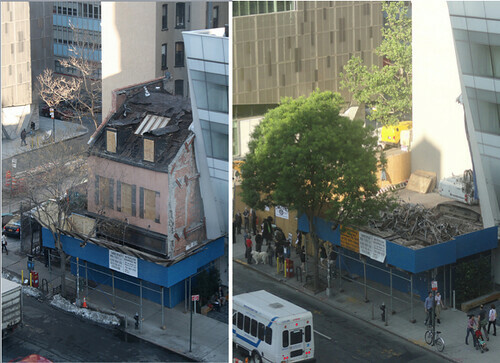 A day after preservationists held a vigil for the demolished 35 Cooper Square, The Local takes a look back at the historic building with archival photographs provided by David Mulkins of the Bowery Alliance of Neighbors, one of the leaders of the campaign to maintain the building. 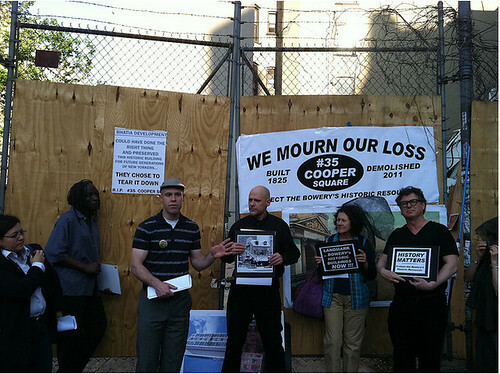 Stephen Rex Brown Preservationists gather at the site of the now-demolished 35 Cooper Square. About three dozen locals dressed in black held what they called a vigil at the ruins of 35 Cooper Square on Wednesday, lamenting the loss of the 19th century building that was built by a descendant of Peter Stuyvesant and once hosted the likes of Diane di Prima, William Burroughs and Cecil Taylor. Mr. Papa and at least a dozen others spoke in front of the plot of land that only two weeks ago featured the two and-a-half story home noted for its Federal-style architecture. Now it was nothing more than a pile of rubble. Tim Milk The developer of 35 Cooper Square has told preservationists that he will not maintain the historic site and will move forward with an undetermined development plan. Update | 6:30 p.m. In a blow to preservationists, the developer of 35 Cooper Square has announced that he will not preserve the historic site and will move forward with an undetermined development plan. “Unfortunately, it was concluded that it would not be feasible to develop the site with the building or any significant portion of it remaining, and that any potential relief” — in the form of a variance — “would not remedy the site conditions which make preservation infeasible,” Stephen Lefkowitz, an attorney for the developer Arun Bhatia, wrote in a letter dated April 28 to City Councilwoman Rosie Mendez. 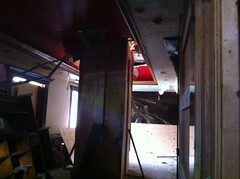 Workers were also seen on site today erecting scaffolding around the historic building. Ian Duncan The author, one of the preservationists trying to forestall the demolition of 35 Cooper Square, issues a call to the developer of the site to cover the roof to prevent further damage. Below: A detail of the roof shortly after work began in February. The recent article, “Developer Cited for 35 Cooper’s Roof” had some readers curious re what’s so important about the roof. The history of this building has been well-told, but the roof and dormers as essential structural elements and character-defining features, are currently compromised by partial demolition and exposure to the elements. Any effort to save this building, at this point, needs to start with the basics: putting a tarp back on the roof. 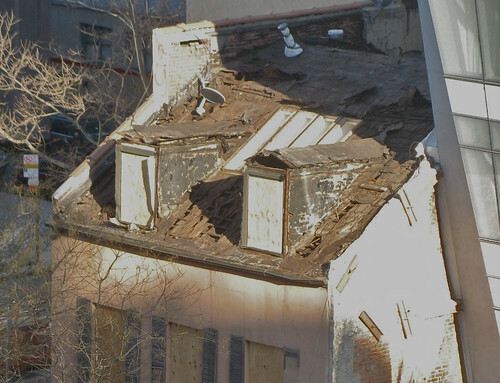 Over the winter, roofing material was removed by workers hired by the new owner under a permit for asbestos abatement, a prerequisite for obtaining a demolition permit. The dormers were similarly stripped of their protective roofing, and non-historic skylights were removed, exposing not only the roof structure but the upper floors of the building to the elements. The old wooden shingles, part of the historic fabric of the building, are now visible, but so too are the gaping holes in the roof. The rain and snow of the past few months are surely accelerating any decay and rot in the 185-year-old structure smacks of demolition by willful neglect. 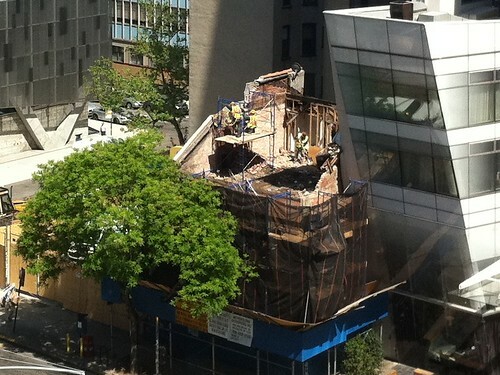 Tim Milk The developer of 35 Cooper Square has been cited by the Department of Buildings for the condition of the historic structure’s roof, which is pictured above in a February photo. 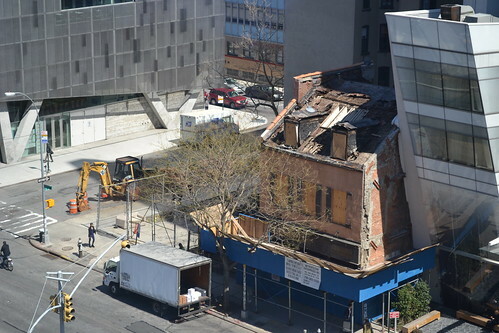 City officials have ordered the developer of 35 Cooper Square to take immediate steps to repair the roof of the historic structure, which has been the subject of a campaign by preservationists to keep it from being razed. On Wednesday, officials with the Department of Buildings issued a citation to the developer of the site, Arun Bhatia, ordering him to make the repairs. Since February, city officials have issued four citations concerning work at 35 Cooper Square, all of which are still open. In addition to this week’s notice regarding the roof repairs, Mr. Bhatia has been cited for failure to safeguard property, performing work without a permit, and failure to post a permit. A spokeswoman for the Department of Buildings said that the citation regarding the roof repairs “means that we had previously issued a violation for the condition of the roof and the property owner has not corrected that condition. 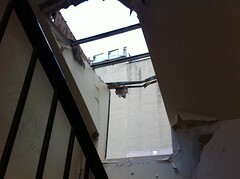 What the property owner should do now is obtain permits to perform the necessary roof work. In this case it would be to close off the roof.” A hearing on the roof violation is set for June. A spokeswoman for Mr. Bhatia, who met with preservationists on Tuesday to discuss the building’s future, did not immediately respond to requests for comment. Tim Milk The developer of 35 Cooper Square met with preservationists this afternoon and listened to arguments for maintaining the historic site. In a room filled with about 20 people at the Neighborhood Preservation Center, Arun Bhatia, the developer of 35 Cooper Square, mostly quietly sat and listened today to requests made by preservationists to keep the building standing. At the meeting, which began at 4:30 p.m. and lasted an hour, Mr. Bhatia arrived with a team of four people, including his spokeswoman, Jane Crotty, his lawyer and historic preservation architect Richard Southwick. Also at the meeting were Andrew Berman of The Greenwich Village Society for Historic Preservation, David Mulkins of the Bowery Alliance of Neighbors, Kent Barwick of the Municipal Art Society of New York and a former Landmarks Preservation Commission chairman, Carolyn Ratcliffe of the Lower East Side Preservation Initiative, and representatives for City Councilwoman Rosie Mendez and State Senator Tom Duane. Hadas Goshen Adding fuel to the fire: the author ponders the place of civility on the Internet. 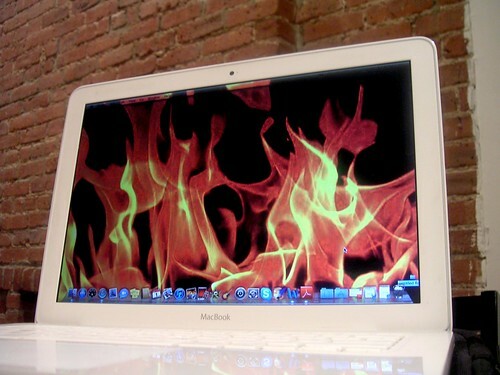 Internet flaming is nothing new. Glowering into the glare of computer screens and cracking fists above keyboards, web users — safe in their basements or bedrooms — have been ranting in chat rooms and online forums for years. Miles and maybe countries away from her recipient, a flamer feels empowered to not only to speak her mind, but scream it — USING ALL CAPS!! Or employing smoldering, DESPICABLE, disgusted and APPALLING language or even $%@^&*#! to communicate the incommunicable!!!! In the vast expanse of the World Wide Web, it used to be that the chances of an actual encounter between the anonymous flamer and flamee was slim to none. But on a hyper-local news blog in the East Village, a slender area spanning about 10 by 15 streets, the cyber-world reduces into a neighborhood, and things get more personal. Is it still O.K. to bash (on a community forum by and for local residents) the storeowner down the block on Avenue A, or that obnoxious woman you always avoid at Tompkins Square dog run? Tim Milk Talks are set for next month between developers and preservationists on the future of 35 Cooper Square. Preservationists are holding out hope that there is still a future for 35 Cooper Square, now that the site’s developer, Arun Bhatia, has agreed to meet with neighborhood groups next month. 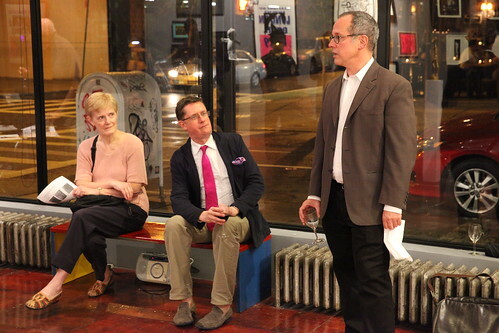 The meeting, arranged through Councilwoman Rosie Mendez, is set for April 12, Andrew Berman, executive director of the Greenwich Village Society for Historic Preservation, told The Local this morning. 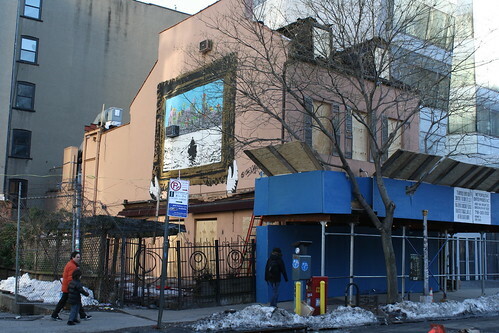 The Bowery Alliance of Neighbors, Historic Districts Council, East Village Community Coalition, and Lower East Side Preservation Initiative are among groups invited to the meeting, which will not be open to the public. The meeting’s tentative location is the Neighborhood Preservation Center on East 11th Street. Local historian Tim Milk recalls dark episodes which never quite extinguished the charm of 35 Cooper Square. They could hardly believe the fellow, wanting to go back to his regiment. Especially considering what he had seen: the rout of the Union at the bloody battle of Bull Run. There, the heroic Lieutenant John S. Whyte, who had refused to leave his wounded commander, fell into Confederate hands. But in a recent prisoner of war exchange, he was returned home to his kith and kin in New York. But he did not wish to retire with honors. Indeed, he was keen to “return to the fight,” he said. 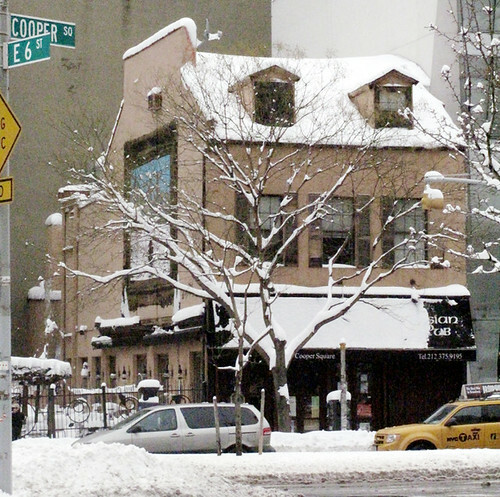 And so his pals shook their heads and dragged him down to the Marshall House, a tavern at 391 Bowery, an address we know today as 35 Cooper Square. There they presented him with a sword and a sash in an affair both touching and festive. After a grand hurrah, the champagne flowed like a river long into that night of March the 21st, 1862. This I found in the archives of the New York Times, in a curious walk down that ancient lane, the Bowery. From out of each door came someone with a tale to tell which, except for these old papers, and poor relics like 35 Cooper Square, would otherwise have vanished, lost in time. 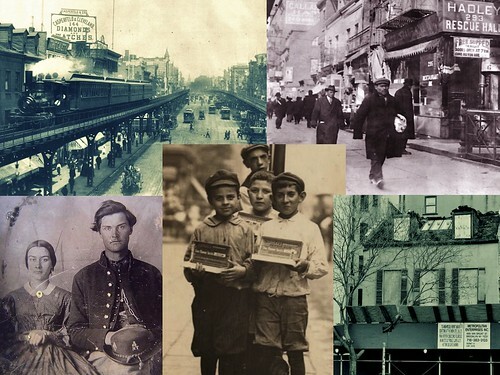 Since 2002, architectural historian Kerri Culhane has worked with Two Bridges Neighborhood Council to document the history of the neighborhoods of the Lower East Side. 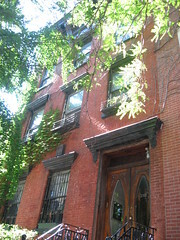 In December 2010 she and Two Bridges received the New York State Preservation Award for Outstanding National Register nomination for the Chinatown and Little Italy Historic District. She is currently writing the forthcoming Bowery Historic District nomination, sponsored by Two Bridges Neighborhood Council and Bowery Alliance of Neighbors. Formerly 391 Bowery, 35 Cooper Square was built between 1825-27, as one of four houses developed on the land of Nicholas William Stuyvesant. Stuyvesant was a direct descendant of the Dutch West India Company’s last director-general, Petrus Stuyvesant. The development pattern north of Houston (then called North Street) remained very rural until the early 19th century. In 1811, a plan to establish a street grid north of the haphazard jumble of streets below Houston was mapped by surveyor John Randel. Third Avenue, branching off of the Bowery, was not built until the early 1820s. Stuyvesant’s four buildings were among the first ever built on this new road — the Bowery spur of Third Avenue. The 35 Cooper Square site is, therefore, an artifact of the most significant urbanization effort of New York, which left us with the grid system that now blankets the island. Claire Glass Scaffolding began to rise around 35 Cooper Square last month. 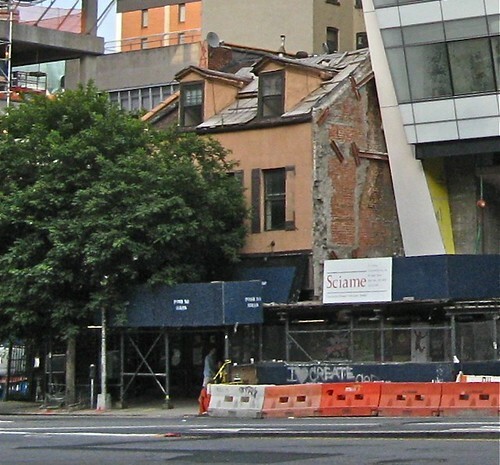 Comments have continued to stream into The Local about an opinion piece by NYU Journalism’s Greg Howard that questioned the value of preserving 35 Cooper Square. A sampling of reactions from the weekend.